It's always fun to run across a new author. To borrow a sports analogy, sometimes, you just have to take a chance that an unknown author will "hit it out of the park" and provide you with something you can't stop reading. I'm so thankful that I took a chance on Tessa Afshar. 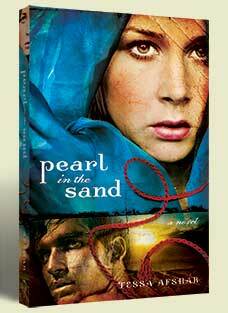 Earlier this summer, a free download on Amazon.com introduced me to Pearl in the Sand - a story based on the untold story of Rahab. In her debut novel, Afshar dives into the story of Rahab, the Canaanite harlot who eventually became the wife for one of the leaders of Israel. Through a story of redemption, faith and love, Afshar explores how Rahab finds redemption through her faith and ultimately because of her marriage to Salmone, becomes part of the genealogy of Christ. 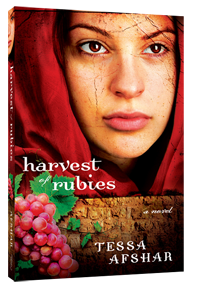 I enjoyed the first novel so much that it led me to seek out her newest release, Harvest of Rubies. Unfortunately, Sarah's view of her self ultimately threatens her future happiness - including her relationship with her husband. Afshar is an amazing storyteller. Her first book made me really dive into an "old" Bible story in a new way. Her second, well, it really makes you take a second look at where a person finds value. In all, I'm thrilled to have discovered a new author. I highly recommend her work - and will probably put them on my "re-read" list. On the scale of one to five, I give her books a solid four. They are enjoyable and easy to read - but will definitely leave you thinking. All in all, a great showing for a new-to-me author! TESSA AFSHAR was voted "New Author of the Year" by the Family Fiction sponsored Reader's Choice Award 2011 for her novel Pearl in the Sand. She was born in Iran, and lived there for the first fourteen years of her life. She moved to England where she survived boarding school for girls and fell in love with Jane Austen and Charlotte Bronte, before moving to the United States permanently. Her conversion to Christianity in her twenties changed the course of her life forever. Tessa holds an MDiv from Yale University where she served as co-chair of the Evangelical Fellowship at the Divinity School. She has spent the last thirteen years in full-time Christian work. Read an interview with Afshar here. Note: As a freelance journalist, I was provided a copy of Harvest of Rubies by it's publisher, through the Net Galley's blogger program. I received Pearl in the Sand as a free Kindle download at Amazon.com This review was not influenced by the free books - just in case you (or the FTC) were worried about this detail.